Ozeki VoIP SIP SDK provides professional technology to create a call assistant application. With the help of the call assistant, work is much easier for the agents who receive the calls. They can see who the caller is and they can answer, reject, hold/unhold or transfer the incoming calls. This example will show you how to create a call assistant application with these basic funcionalities. Controlling the call: you can learn how to control calls, for example: how to transfer them to another party. What is a call assistant? The main role of the call assistant is to make the work of your employees easier. Eventually it is a collection of useful applications. The present example introduces the call assistant softphone application with a simple Graphical User Interface (GUI). This sample program can handle not only incoming but also outgoing calls. This example checks for the incoming caller in the database, and if the caller can be found in the database, the data of the caller will be shown (username, full name, country, note). Besides this, the present sample capable of rejecting, holding/unholding and transferring the call. In this present example, the application uses a local database provided by Visual Studio 2012. Of course, you can switch from this database to any other database. If you want to create a local database you should right click on the project then choose Add, New Item, and here select the Service-based Database option from the list. Now in this example, the name of the database will be UserInfoContainer.mdf. After that you can create the UserInfos table. The data of the users (username, real name, country, note) are stored in this table. The sample example project contains 4 classes: UserInfo.cs, DatabaseManager.cs, MainForm.cs and Program.cs. The UserInfo class is responsible for the UserInfo object that handles the data of the users. The Program.cs class runs the example. This is the main entry point for the application. You can access the local database with the help of the DatabaseManager class. For the access, you need a connectionString, the name of which can be found in the name property of the App.config files. The constructor of the DatabaseManager class creates this connectionString variable and the SqlConnection object. Then it calls the OpenConnection() method in order to connect to the local database. Furthermore, it calls the TestAdder() method. As a result, a few test users will be added to the database with the help of a simple SQL INSERT command. The DatabaseManager class contains a GetOtherPartyInfos() method, which reads the data of the users in the local database. This happens with a simple SQL SELECT query, where the username is the same as the caller username. If the caller username is not in the database, the call assistant shows unknown (N/A) information. The MainForm.cs class contains the MS Windows Forms GUI (Figure 1), and the whole logic of the sample program (except the database handling and the user info representation). 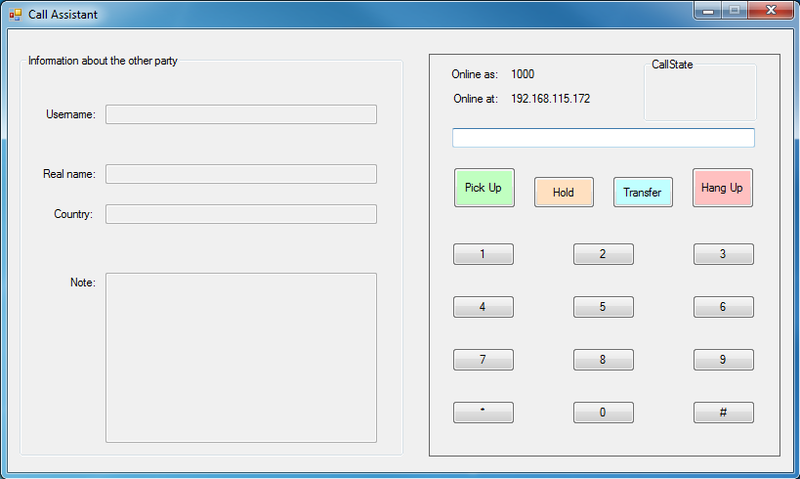 How to make and accept calls using SIP/VoIP? How to use media handlers? How to control calls using SIP messages? Besides, there is a detailed tutorial video series on how to build a softphone with GUI. The first episode of this series is about SIP registration. As you could see, to create a call assistant applications with Ozeki VoIP SIP SDK is really simple, and you also have several options to configure that. As you are now familiar with all the terms concerning this topic, now it is time to take a step further and explore what other extraordinary solution Ozeki VoIP SIP SDK can provide to you.